Ok, so this breakfast is just not disguised as dessert – it really tastes like dessert! I was a little apprehensive going in….chocolate based breakfast? Kind of like feeding your kids Chocolate Puffs and other chocolate cereals for breakfast. But after testing it, I’m convinced! This is just overwhelmingly delicious – and the good thing about making it yourself is that YOU can control how sweet you want it. In addition, it is super-easy, filling and healthy – so I say we have a winner. You have to like the feel of the chia seeds – otherwise I would suggest grinding them before use. 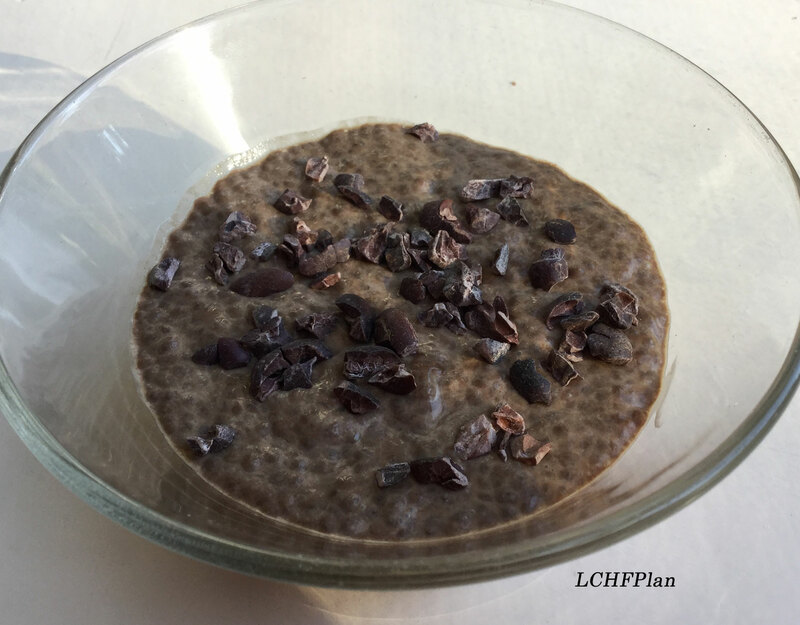 And I added a little raw Cacao Nibs on top – they gave it just that little extra crunch and feeling of luxury. Use a bowl with a lid – I used a Pyrex glass bowl. Stir the almond milk, cream and cacao powder until the cacao powder has been dissolved. Stir in fiber syrup and chia seeds. Leave in bowl with lid on over night in the fridge. Stir, sprinkle with cacao nibs and serve! Easy, fast and delicious.